I don’t know about you, but I am always looking for a healthy snack that will keep me full without much effort. These almond butter date balls fit the ticket perfectly! Protein-packed, convenient, and easy to make. Plus, dates add a sweetness that kids (and adults) love! This week I visited a good friend and her adorable toddler. So much of what I know about being a mom has come from watching this good friend. And with this visit, I was introduced to the difficulties of feeding a toddler. Not. Easy. Am I right? Despite her valiant efforts, most of what he wanted to eat was not what she wanted him to fill up on. When carbs taste so good, why eat anything else, right? I don’t blame him. But keeping kids full on carbs is tough, and a balance of all food groups is important. We decided to try making some protein-dense date balls to see if they might be something both my friend and her toddler could agree on. And I think we found success. 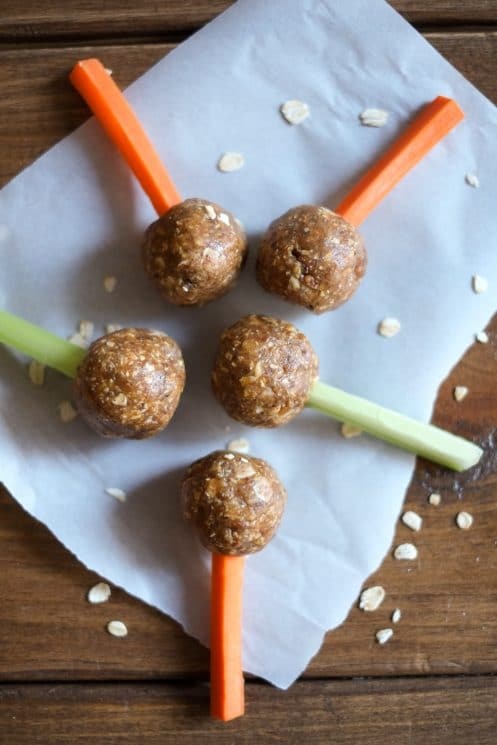 Energy balls have been all the rage lately, and now I see why. These little guys are delicious and filling, not to mention easy when you’re busy running around. To make the date balls, pretty much all you need is a food processor. Well, that and your hands. The first step is to soften the dates just a bit so that they blend nicely. Cover the dates in water for 10 minutes so they soak up some moisture. After ten minutes are up, drain the dates and plop them into the food processor. Next, add the oats and almond butter to the food processor and pulse everything until a paste forms. Fold in the chopped pecans and then press small handfuls of the concoction into balls. If the mixture seems dry, just add a bit more almond butter. If wet, add some oats. Tip: to keep hands from getting super gloopy and sticky, spray your hands with non-stick cooking spray before forming balls. And that’s it. 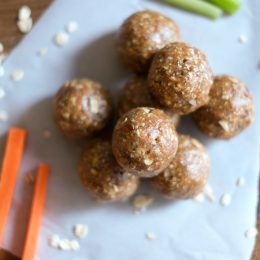 Keep these balls in an airtight container on the counter for a few days, or in the fridge for a few weeks. Now you and your kids know what to grab when you need something quick, tasty, and filling. 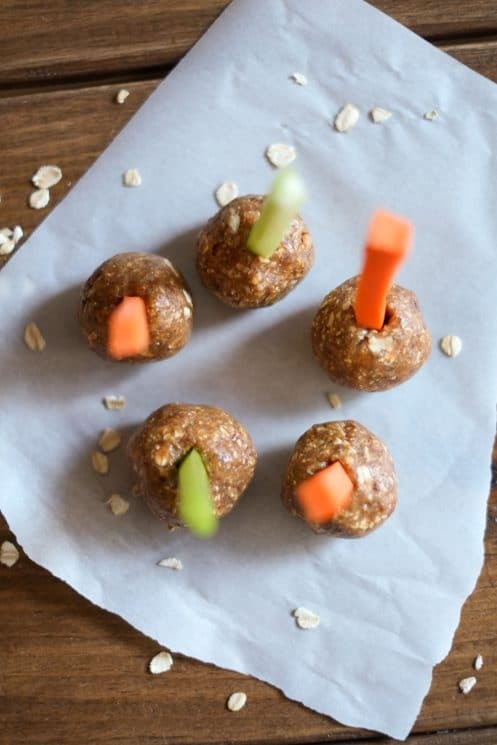 Our very own Terita came up with the idea of making these date balls into pops. And not just any pops – veggie stick pops. 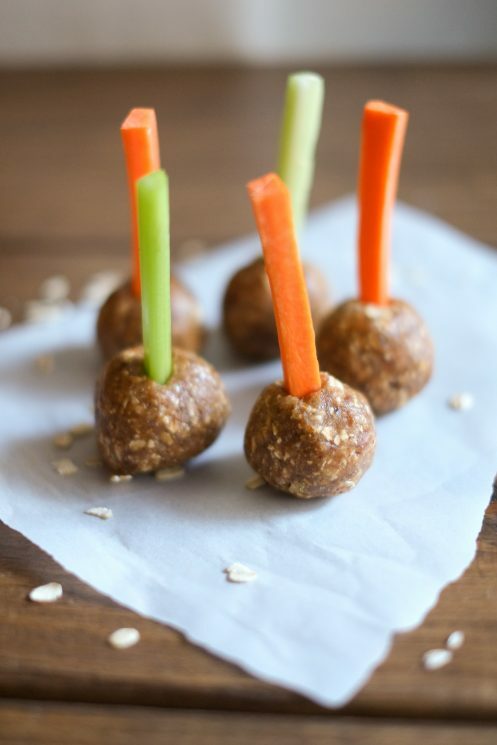 That’s right, we’re using carrots and celery to serve these snacks up. 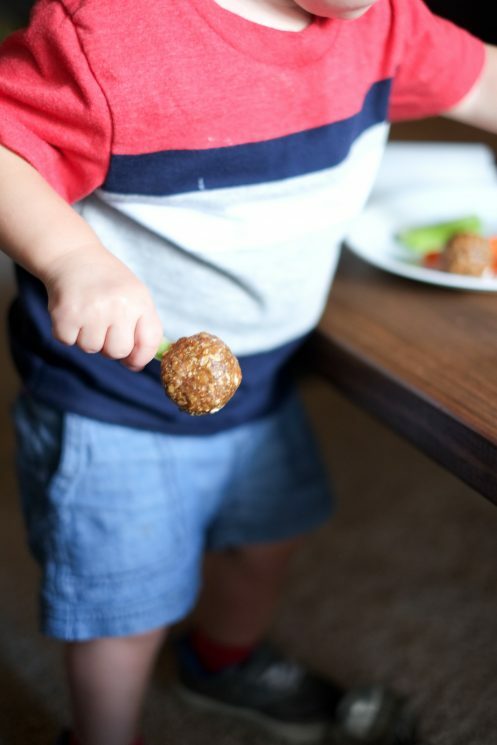 Not only do kids love eating almost anything on a stick, but these sticks add just a little veggie to the snack. I’ll admit, I was skeptical at first, but now I’m totally a believer. It’s kind of like eating celery and peanut butter (which is probably my favorite snack). And the verdict? Toddler (and mom) approved. 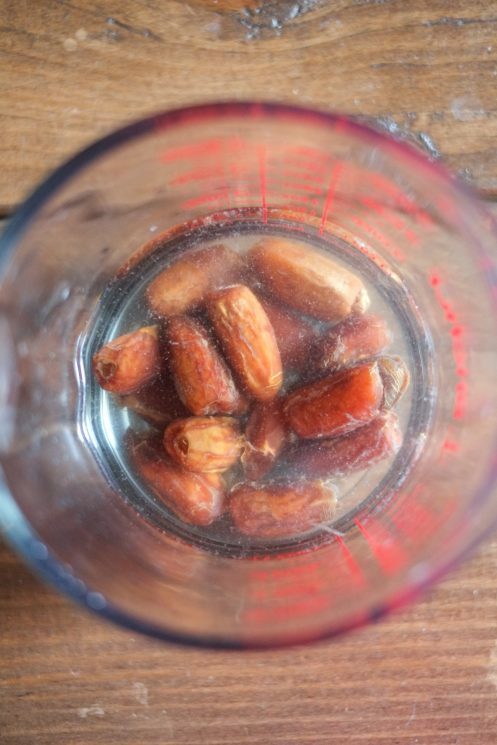 Soften dates in warm water for 10 minutes, then drain. Place dates, oats, and almond butter in food processor and pulse until a smooth paste forms. Mix in pecans. Spray hands with cooking spray and roll equal portions into small balls. According to some, the most a toddler should have is about 17 grams of sugar per day. These “healthy” snack balls come in at 8 grams of sugar each. It’s the dates that push the healthy envelope. I used to cut up several dates to have on my oatmeal in the morning but have cut back to just one. Hi Kath, limiting sugar is wise, but most especially added sugars! Dates are a natural source of sugar, so while you may not want to eat handfuls of them they are a great part of a healthy diet when used in moderation. 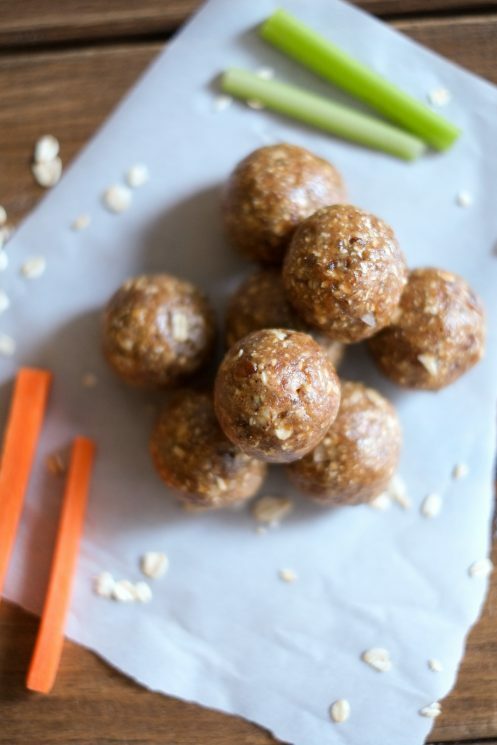 Thank you for posting a date ball recipe that doesn’t include coconut! Every other recipe I find has the exact same ingredients, but yours is great! I was hoping I could use oats as well, so Im excited to make this! Are you sure it is okay to eat raw oats?